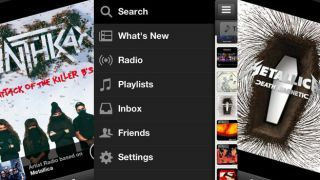 Music streaming service Spotify has issued a major update to its app for iOS devices, bringing a revamped user interface and easier, faster navigation for subscribers. The app's look and feel hadn't altered much since its introduction back in September 2009, but today's update brings a very welcome sidebar navigation tool similar to the UI employed on Spotify's Android app. Swiping from left to right now brings up the Search, Playlists, and Radio portions of the app, which had previously sat at the foot of the screen. The features sit alongside What's New, Friends, Inbox and Settings tabs. Version 0.60, as it's been coined, also brings a neat Now Playing title bar, which resides at the bottom of the screen when browsing the app, meaning users are able to see what's playing at all times. From the Title Bar users can swipe left or right to move back or forward a song, pause and restart, and can also drag up to launch other the full cover art and other playback options. Users can then tap the cover art for the options to Scan, Share, Star, Add To Playlist or Start Radio from a particular track as well as Shuffle, Repeat or adjust the volume. Each track listed within search results is now accompanied by a "..." button, which prompts a revamped Track Menu, allowing users to perform much of the above functionality without actually playing the track. A minor pet peeve of ours previously was actually having to play a track before we could add it to a playlist. Although the release notes do not mention it, the new Spotify update is definitely zippier than its predecessor. Navigation is faster, while custom radio stations begin playing almost instantly. There's also fixes for a host of annoying little bugs that had plagued the user experience on previous versions. The app will no longer display a pesky "track won't play offline" notification on start-up, and the correct current track will also appear in the lockscreen. The update is available to download from the App Store now.